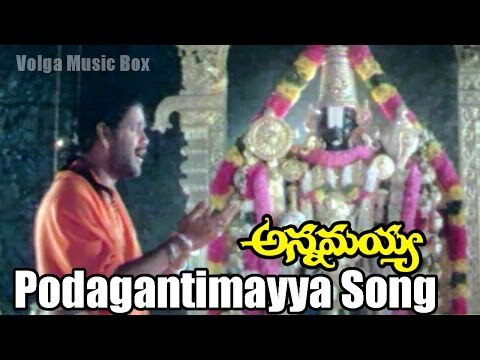 Annamayya Video Songs Padhaharu Kalalaku Nagarjuna Ramya Krishna Kasthuri....! Watch Latest Telugu Video Songs @ https://goo.gl/YkBWDm --------------------------------------------------------------------------------- ◙ ◙ ◙ Our Most Popular Entertainment Channels ◙ ◙ ◙ Trailers & Latest Movies : : https://goo.gl/vVKfd3 Comedy Club : : https://goo.gl/3bfSpB Telugu Full Movies : : https://goo.gl/fM1o4y Volga Music Box : : https://goo.gl/E5K2JI Movie: Annamayya, Cast: Akkineni Nagarjuna, Ramya Krishnan, Mohan Babu, Kasthuri, Roja, Bhanu Priya, Suman, Director: K. Raghavendra Rao, Music: M. M. Keeravani, Producer: Doraswamy Raju, Release Date; 22 May 1997. 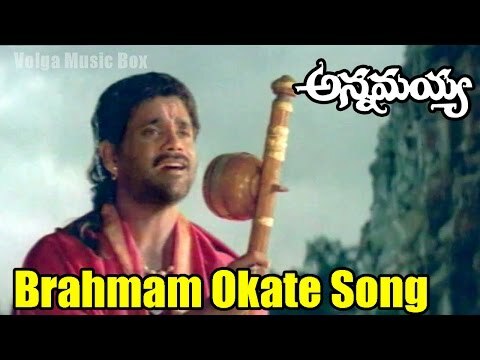 Songs: Vinaro Bhagyamu Telugu Padaniki Ele Ele Maradala Padhaharu Kalalaku Kalaganti Kalaganti Adhivo Alladivo Podagantimayya Vinnapalu Vinavale Sobhaname Sobhaname Moosina Muthyalake Asmadeeya Kondalalo Nelakonna Emoko Palanethralu Nigama Nigamantha Govindaa Sritha Nanati Bathuku Dachuko Nee Padaalaku Antharyami Brahma Kadigina Padamu Story: Lord Vishnu (Suman) listens to requests from his consort Lakshmi (Bhanupriya) that there weren't many people singing songs in praise of the Lord in Telugu language. In response, the Lord sends Nandaka (His sword) to be born as Annamacharya to a childless couple in Tallapaka village, Kadapa District. 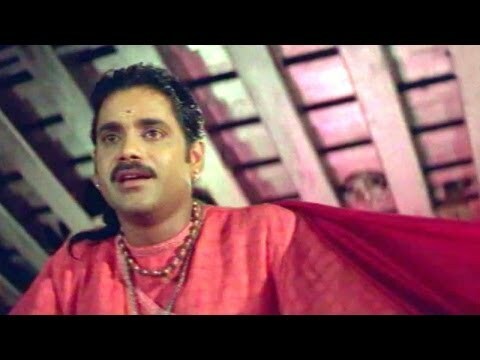 Growing as a normal young man, Annamayya (Akkineni Nagarjuna) is in love with his 2 cousins Timakka and Akkalamma (Ramya Krishnan and Kasturi) and thinks that his cousins are the most beautiful creations of god.Lord Vishnu appears in front of Annamayya in disguise and accepts a challenge from him to show someone more beautiful than his cousins - GOD in the form of Lord Venkateswara in a temple in his village. Upon discovering the beauty of Lord, Annamayya is lost in a different world and ends up making a pilgrimage to Tirumala Venkateswara Temple without planning or informing his parents. As his find pilgrims enter the holy hills, he is lost and is helped by Goddess Lakshmi herself in the form of an old lady by informing him that his footwear was preventing his progress. Also weakened by fasting, Annamayya accepts Laddu - a prasadam from the food consecrated by the Lord himself. Upon reaching Tirumala, he is enthralled by the beauty of God and settles there to write and sing hymns in praise of the Lord.Annamayya's parents get worried regarding Annamayya's whereabouts. Then, the Lord Venkateshwara, hearing the prayers of Lakkavaamba (Annamayya's mother), himself comes in the disguise of a Hunter along with his consorts and tells them that Annamayya lives in Tirumala. Then, Annamayya's parents, cousins, aunt, uncle and his 2 friends come to Tirumala and watch him worship the Lord.When Annamayya is asked to marry his 2 cousins, he refuses saying that his life is dedicated to the service of the Lord and marriage would become a hindrance to it. But, he is then convinced by the Lord himself who has now taken the form of a Brahmin. The Lord personally conducts theweddingof Annamayya with his cousins - Timakka and Akkalamma.After the birth of children, Annamayya settles in Tirumala leaving his children in the care of his parents. Through encounters with the local administrator (Tanikella Bharani), he comes in contact with the ruler of the country - Saluva Narasimha(Mohan Babu) who becomes a fan of his songs and make him the court poet. On hearing a Sringara Sankeertan, the King and Queen (Roja) request that Annamayya sing a sankeertan in their praise as well, something Annamayya rejects as he would sing only for the Lord and not for any human being. Jailed for not heeding to the King, Annamayya invokes Lord in the form of Narashima (human-lion) and to the surprise of the King, jailors and everyone - the iron rods burst into flames and releases Annamayya.Realising that their husband was born for humanity and Lord's service, his wives give up their lives freeing Annamayya of any earthly attachment. Annamayya realizing the divine order takes to writing poems and sankirtans and reaches old age. Priests and Brahmins unhappy with his social inclusion of lower caste people in the temple try to destroy his writings. When Annamayya decides to sacrifice his life because all his works were lost, a significant portion of his work is saved by Lord's grace from the fire. Saluva Narasimha and Annamayya's sons convert his work from palm to copper encriptions thus preserving his works for eternity. On completion and dedication of the work in the temple sanctum sanctorum, the Lord and his consorts appears one last time, in their divine form. The Lord grants salvation and Annamayya's soul returns as Nandaka (Sword). Watch & Enjoy Annamayya Movie Video Songs Exclusively on #SkyVideos Telugu Channel, Annamayya is a 1997 Telugu biographical devotional film produced by V. Doraswamy Raju on VMC Productions banner, directed by K. Raghavendra Rao. Starring Akkineni Nagarjuna, Mohan Babu, Suman, Ramya Krishna, Bhanupriya, Roja, Kasturi played the lead roles and music composed by M. M. Keeravani. This film recorded as Blockbuster at box-office. This film is cinematic of life of 15th century composer, Annamacharya. Upon release, The film has received positive reviews and won eight Nandi Awards three Filmfare Awards and two National Film Awards. 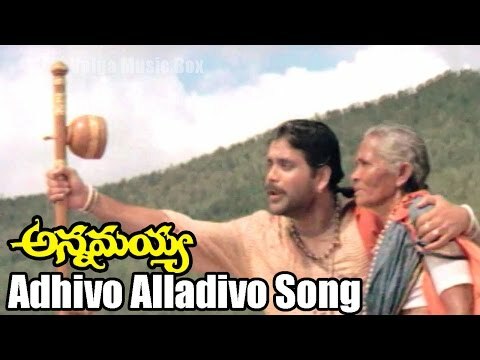 Song Name: Padharu Kalalaku Movie Name: Annamayya Singers: J. K. Bharavi, Mano Composer: Keeravani. For More Latest & Old Telugu Movies and Video Songs Please Subscribe #SkyVideos Telugu channel.